Qoya is a movement practice founded by Brooklyn and LA based, Rochelle Schieck. “Qoya” is a Quechan (Indigenous Tribe of the Andean Region) word for Queen, a female manifestation of higher consciousness. This practice is a shift in consciousness drawn from the wisdom of yoga, the creative expression in dance and freedom through sensual movements. Simply put, through the intuitive movement practice of Qoya we remember who we are- and we are wise, wild and free! 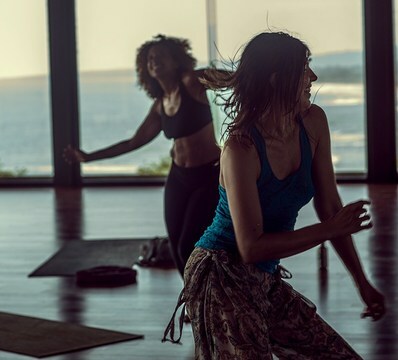 In each class we will create sacred space, set intentions, and connect with ourselves through breath and movement- a little bit of yoga & a little bit of dance. It never matters how “it” looks, but the focus is instead on how we feel. Through the practice we will also celebrate community by sharing with other women in the group. Each class is unique, with a particular theme to help set our intentions. And, we will do all of this to GREAT MUSIC! Qoya – A Movement Practice for Women is part of Vuka's 6-week summer class program. Susan has been teaching yoga full time for over ten years in many cities and multiple countries. Susan has studied and teaches Bikram Yoga, Bishnu Ghosh Series of 84 Asanas, Classic Hatha Yoga, Breathwork, and Meditation. Recently trained to lead Qoya, Susan is very excited to share this guided practice with other women. The first intention of a Qoya practice is to do what feels good. It is a simple, yet a profound way to be in the body - letting the heart guide you to do what feels good, which really is a metaphor for a healthy life. Yeah, I have seen people are not that conscious about the health because they are so busy in the office work or https://www.topdissertations.org/academized-service-review/ else but you are doing a great job by spreading health info. It never matters what "it" looks like, however the attention is rather on how we feel. Through the training we will likewise commend group by offering to other ladies in the gathering. On the other hand, I'm looking official website to get more reliable information for me. Please park in our lot or on the street - just be aware of residential parking signs.